Himachal Pradesh, India (Web Desk): It is said that Allah has created every human with his or her soul mate and no matter what, someday they will gather and become a part of each other. 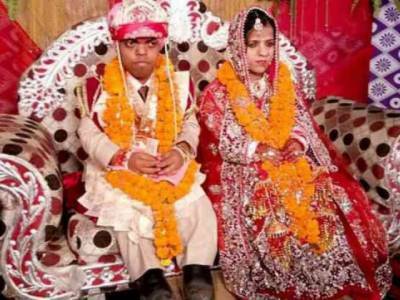 A similar life story was spotted in India’s Una district of Himachal Pradesh where ‘smallest’ couple, having same height of 5 feet, tied the knot, Daily Mail reported. The groom Rajesh Kumar is 34 years old while the bride, Shelja Kumar is 30 and the couple tie knot in an intimate and touching completely arranged ceremony. The couple feared they will never get married but instead were blessed with a grand function in presence of their loved ones. “My wife has completed me and I will always take care of her,” said Rajesh. The couple believes that they were made for each other.